1. Love hinders death. Love is life. All, everything that I understand, I understand only because I love. Everything is, everything exists, only because I love. Everything is united by it alone. Love is God, and to die means that I, a particle of love, shall return to the general and eternal source. 2. To love life is to love God. Harder and more blessed than all else is to love this life in one’s sufferings, in undeserved sufferings. 3. Seize the moments of happiness, love and be loved! That is the only reality in the world, all else is folly. It is the one thing we are interested in here. 4. It is not beauty that endears, it’s love that makes us see beauty. 5. It is possible to love someone dear to you with human love, but an enemy can only be loved by divine love. 6. I think … if so many men, so many minds, certainly so many hearts, so many kinds of love. 7. He had heard that women often love plain ordinary men but he did not believe it, because he judged by himself and he could only love beautiful mysterious exceptional women. 8. And all men live not by the thought they spend on their own welfare, but because love exists in man. 9. I have now understood that though it seems to men that they live by care for themselves, in truth it is love alone by which they live. 10. If you make it a habit not to blame others, you will feel the growth of the ability to love in your soul, and you will see the growth of goodness in your life. 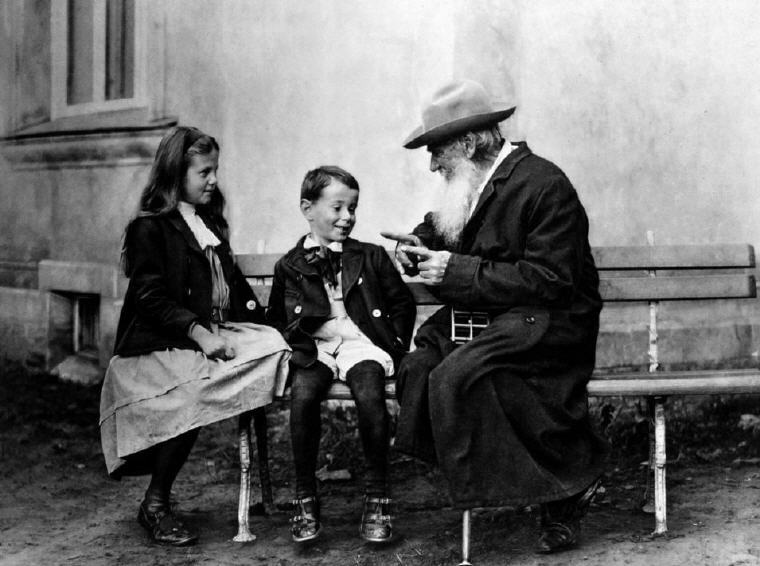 Wikipedia: Leo Tolstoy, or Count Lev Nikolayevich Tolstoy (September 9 [O.S. August 28] 1828 – November 20 [O.S. November 7] 1910), was a Russian writer widely regarded as among the greatest of novelists. 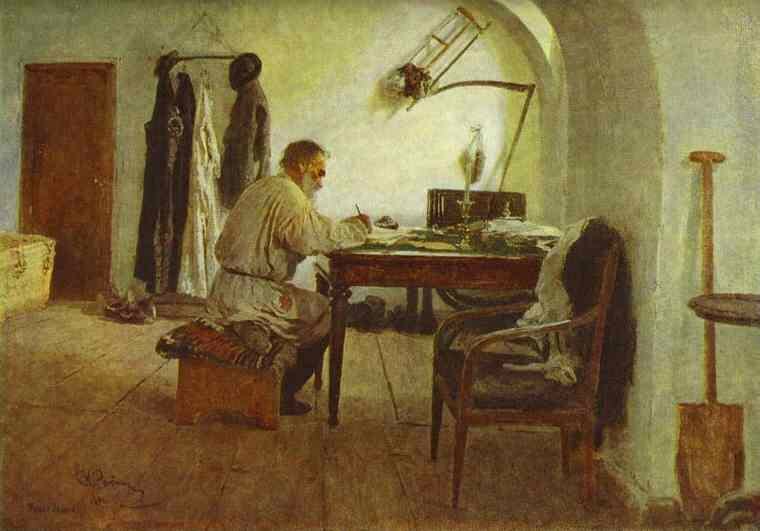 His masterpieces War and Peace and Anna Karenina represent in their scope, breadth and vivid depiction of 19th-century Russian life and attitudes, the peak of realist fiction. 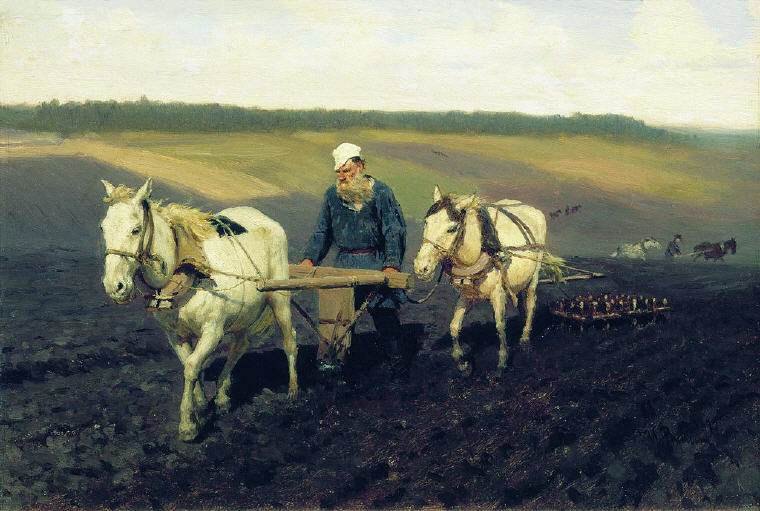 Tolstoy’s further talents as essayist, dramatist, and educational reformer made him the most influential member of the aristocratic Tolstoy family. His literal interpretation of the ethical teachings of Jesus, centering on the Sermon on the Mount, caused him in later life to become a fervent Christian anarchist and pacifist. His ideas on nonviolent resistance, expressed in such works as The Kingdom of God Is Within You, were to have a profound impact on such pivotal twentieth-century figures as Gandhi and Martin Luther King, Jr.
1. A man can live and be healthy without killing animals for food; therefore, if he eats meat, he participates in taking animal life merely for the sake of his appetite. And to act so is immoral. 2. All happy families resemble one another, each unhappy family is unhappy in its own way. 3. You see, if you take pains and learn in order to get a reward, the work will seem hard; but when you work … — if you love your work, you will find your reward in that. 4. But art is not a handicraft, it is the transmission of feeling the artist has experienced. 5. The more is given the less the people will work for themselves, and the less they work the more their poverty will increase. 6. There can be only one permanent revolution — a moral one; the regeneration of the inner man. How is this revolution to take place? Nobody knows how it will take place in humanity, but every man feels it clearly in himself. And yet in our world everybody thinks of changing humanity, and nobody thinks of changing himself. 7. There is only one enduring happiness in life—to live for others. 8. I have lived through much, and now I think I have found what is needed for happiness. A quiet secluded life in the country, with the possibility of being useful to people to whom it is easy to do good, and who are not accustomed to have it done to them; then work which one hopes may be of some use; then rest, nature, books, music, love for one’s neighbor — such is my idea of happiness. And then, on the top of all that, you for a mate, and children perhaps — what more can the heart of man desire? 9. In all history there is no war which was not hatched by the governments, the governments alone, independent of the interests of the people, to whom war is always pernicious even when successful. 10. The only significance of life consists in helping to establish the kingdom of God; and this can be done only by means of the acknowledgment and profession of the truth by each one of us. 11. And there is no greatness where there is not simplicity, goodness, and truth. 12. A battle is won by him who has firmly made up his mind to win it. Why did we lose the battle at Austerlitz? Our losses were almost equal to those of the French, but we very early said to ourselves that we had lost the battle, and so we had. 13. The only thing that we know is that we know nothing — and that is the highest flight of human wisdom. 14. Pierre was right when he said that one must believe in the possibility of happiness in order to be happy, and I now believe in it. Let the dead bury the dead, but while I’m alive, I must live and be happy. 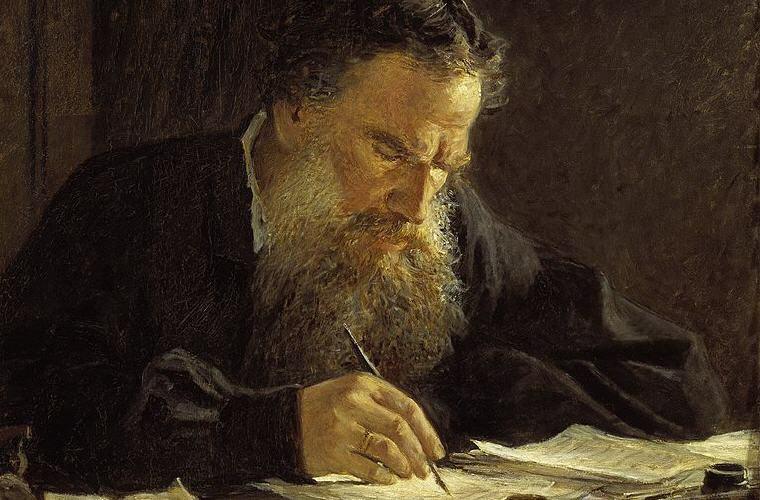 #15 Leo Tolstoy, On Life and Essays on Religion, p. xvi. 15. Free thinkers are those who are willing to use their minds without prejudice and without fearing to understand things that clash with their own customs, privileges or beliefs. This state of mind is not common, but it is essential for right thinking; where it is absent, discussion is apt to become worse than useless. 16. To be good and lead a good life means to give to others more than one takes from them. 17. The truth is obtained like gold, not by letting it grow bigger, but by washing off from it everything that isn’t gold. 18. The vocation of every man and woman is to serve other people. 19. The happiness of men consists in life. And life is in labor. 20. One is ashamed to say how little is needed for all men to be delivered from those calamities which now oppress them; it is only needful not to lie. 21. All violence consists in some people forcing others, under threat of suffering or death, to do what they do not want to do. 22. … to say that a work of art is good, but incomprehensible to the majority of men, is the same as saying of some kind of food that it is very good, but that most people can’t eat it. 23. Every lie is a poison; there are no harmless lies. Only the truth is safe. Only truth is so firm that I can rely on it. Only truth gives me consolation — it is the one unbreakable diamond. 24. Man cannot possess anything as long as he fears death. But to him who does not fear it, everything belongs. If there was no suffering, man would not know his limits, would not know himself. 25. Genuine religion is not about speculating about God or the soul or about what happened in the past or will happen in the future; it cares only about one thing—finding out exactly what should or should not be done in this lifetime. 26. Everything comes in time to him who knows how to wait. 27. The strongest of all warriors are these two — Time and Patience. 28. Remember then: there is only one time that is important—Now! It is the most important time because it is the only time when we have any power.